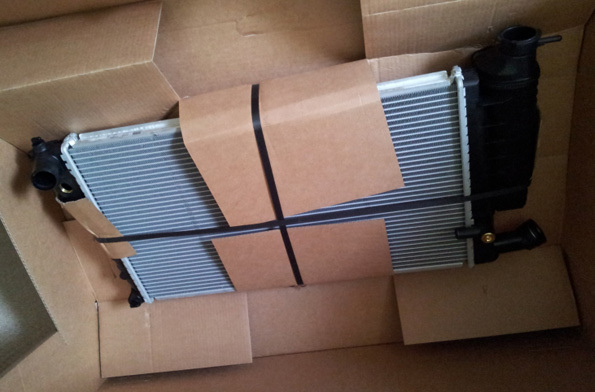 The radiator in my GTi-6 was well past its best so in the interest of 'preventative maintenance' (i.e avoiding having the contents of the cooling system make a break for freedom when i'm 50 miles away from home at 1am) I thought it would be wise to replace it. After much deliberation and research I decided to go with a Nissens aluminium radiator from these guys rather than getting an OE replacement. Nissens have a good reputation and because it's made from aluminium is a good deal lighter than the standard. I've heard rumours they can be up to half the weight but have yet to test this myself, I expect the difference will be exaggerated if you weigh a 8 year old one which is full of crud and corrosion compared to a brand new unit. After a few days a big cardboard package arrived at work and we are in business, initial impressions are good and the build quality seems high. I intended to get this fitted months ago (when the weather was still hot) but due to the awful wet weather we had and other commitments never got round to it. All in all it's quite an easy job, the two awkward parts are getting the radiator in/out and routing the bottom hose through the chassis. Plastic fitting with two "wing" clips opposite each other which hook in around a collar on the radiator. Metal fitting which is push fit and is held in place by a C-Clip. On the rear of the rad there is a hose fitting which protrudes about 3cm which is just enough to foul on the inlet manifold, after a few attempts we found the easiest thing to do is tilt the slam panel forward a bit which just gives you enough room to wiggle it out. To do this there are just two bolts that go into the wings which you will need to undo - these are circled in red below. 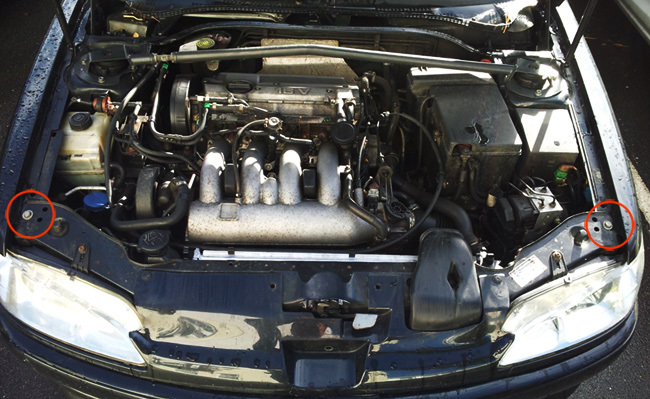 We also undid the 3 bolts which hold the headlights in. Apart from that you just need to whip off the snorkel for the air box, unclip the throttle cable, remove top hose and bottom hose, unclip radiator and away you go IIRC. As it turns out when we took it apart both the old radiator and air conditioning condenser were in a pretty sorry state and basically fell apart. I knew the lower air conditioning pipes were corroded anyway (they all are now) and had no intention of replacing them so I didn't bother putting the condenser back in. 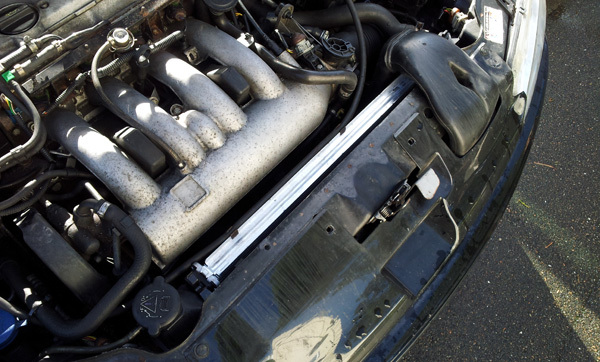 It was all gunked up anyway so all it is going to do is reduce air flow to the radiator. Something else we came across which is useful to note is the radiator hose fitting was initially twisted compared to the fitting on the radiator. This meant the little wings on the hose did not line up with the c-clip properly which meant it was not held securely. Watch out for this or you could find the hose will blow off. Put it all back together and bled the system to remove all the trapped air and jobs a good 'un. Seems to run noticeably cooler in traffic now and the coolant system had a good flush. Thanks for reading and I hope this is helpful to someone, any comments please leave them below. We are delighted you are happy with your radiator. This is a really useful write up with loads of useful information. I hope its ok we put a link or two to this page from our blog/website, if this is a problem just let us know. Not a problem you are most welcome, hopefully the parts numbers will be useful, I know a lot of people have not realised about the lower hose until the day of fitting.